Since the nineteenth century until late in the twentieth century, women have only been employed in female correctional facilities and only in the contact position and not in management (Wright & Saylor, 1991). There are various reasons why female officers were not recruited in male prisons and among them being; concerns about the safety and security of the female officers in the presence of the inmates where they were at risk of being raped by the sexually deprived male inmates. It would require the female employees to be protected by their male colleagues an action that would put them in danger too. Some of the prisoners jailed may be violent and would probably overwhelm the female officer physically and emotionally, and it was preserved that the female officers would not handle it. The other reason would be the effect on the inmates’ behavior as a result of exposing them to a female counterpart considering that most of them have been in the correctional facility for a very long time this would lead to the female officers having sexual involvement with the inmates (Newbold, 2005). Lastly, there was a strong opposition as it would be a violation of the privacy of the prisoners as they would not be allowed to conduct strip searches hence increasing the workload on their male counterparts (Farkas & L. Rand, 1997). There was, however, a change of perception in the 1970s where integration of the women officers in male prisons was considered. The change was as a result of various reasons among them being a growing realization of women. Women discovered that there were greater opportunities in men’s correctional facilities as the pay was higher than that of women correctional facilities. Another chance was that the male correctional facilities presented an opportunity for women to be promoted to management positions if one had a wider experience in the correctional institutions and how the system worked. The primary reason for the change was however due to the amendment of the law that prohibited employment discrimination on a gender basis. The Congress made the changes in 1972 which saw an increase in the number of female working as officers and holding other positions in the male correctional institutions (Farkas & L. Rand, 1997). Through the amendments, women were able to file lawsuits against the correctional management which refused to hire them by gender in all male prisons. The issue of prisoner privacy remains contested as prisoners also have their rights to privacy as dictated by the constitutional privacy rights under 42 U.S.C of 1983. As a result, several issues regarding the privacy remain unaddressed while their impact on women employment in male correctional facilities remain unclear. However, it is clear that the issue of privacy is one of the many that make a woman’s career in correctional facility difficult. I will try to examine some of the challenges women face as they work in male prisons, how they cope with difficulties in the field and some of the interventions that can be used to help them deal with the environment. The number of women working in correctional facilities has been on the increase for the past few decades leading to the twenty-first century. Statistical data presented in 2005 showed that there were a total 69,299 female employees out of the 419,637 correctional employees. In 1999 they were approximately 69,199 female officers out of 207,600 working in the correctional facilities. In 1978, Texas male correctional facilities did not have even a single female officers but by the end of 1998 over eight thousand women were working in the correctional facilities in the entire Texas (Flannery, 2011). Women are penetrating in each and every industry, and they are not only working at junior levels but are also entering into leadership positions. In 2006, 127,000 women were working in correctional facilities as bailiffs, jailers, and correctional officers compared to the 324,000 men working in the same field. 29% of whom were working as first-line supervisors of civil correctional servants. There was also a 13% increase in additional supervisory staff which was composed of women (Jurik, 2007). Statistical data shows that there are more females in the U.S as compared to the number of men at their life expectancy is longer while their participation in the workforce is on the rise hence a future with female dominated workforce is expected. Correctional professions are not left out on this as more and more women are getting interested. Challenges women face working in correctional facilities. As seen earlier, opposition to women working in correctional facilities was based on the perception that women would have difficulties dealing with the inmates. On the contrary, the challenges women face on these career path emanate from their male colleagues (Jurik, 1985). In a research conducted in New Zealand’s men’s correctional facilities, it was discovered that women were employed in these institutions amidst opposition from male staff. The female themselves during the interviews for the jobs predicted that they would face opposition from the male staff. The predictions came to pass as some male officers had difficulties in accepting the women and reluctant in welcoming hence remained resentful. Women face insults and ridicules from their male colleagues all of which are a form of disrespect. The unconducive environment was particularly at its peak during the 1980s when the law that allowed women to be employed in any sector was passed. The pressure resulting from this caused many women to quit their job as they could not handle the pressure. In 1991 at Invercargill medium security prison, an incident was reported by the internal inquiry where the first female officer to work there was placed alone in the yard with male inmates. The officer had been accused of sexual relation with prisoners, received obscene phone calls and her handbag was put in a toilet bowl. All of which was done by her male colleagues. The officers who were responsible for this however faced disciplinary action and the female officer had to be transferred to another correctional institution (Newbold, 2005). Actions like these caused women to be isolated at their workplace as they lacked support from the people they worked with resulting to them forming friendships with the inmates. The rejection, mistreatment and lack of respect for the female officers from their colleagues may lead to the female officers befriending the prisoners, an action which may turn out to be dangerous. The female officers may fall prey of the manipulative inmates who might take the opportunity to get favors from the officer. Many of the staff fall in the hands of the manipulative inmates as they tend to search for acceptance, approval and reinforcement and the attacks from their colleagues make them even more vulnerable (Cullen, Link, Wolfe, & Frank, 1985). Statistics also show that due to the nature of women, they are more susceptible to manipulation than men. Research conducted in 2005 revealed that 78.5% of the victims of manipulation by the inmates are women (Nink, 2008). The fact that this makes the women vulnerable puts the correctional institutions at a jeopardy as the prisoners can use the compromised officer to sabotage any operations in the facility or even escape from the facility. Due to the perseverance of the few who did in the beginning, the number of women in the correctional facilities has increased. The results are seen by the number of women in the industry. In the past decade, women only took 24.5% of the workforce, but by 2007 the numbers had risen to 40% women occupying the positions in adult’s correctional facilities and 42% in juvenile making them the majority in many correctional institutions (Smith & Loomis, 2013). Other than rejection from their workmates, many female officers have reported being sexually harassed by their colleagues, supervisors, and even the inmates. The sexual harassments in consideration include graphic sexual rumors about them created by their fellow staff. The stories are created by male and female colleagues and the inmates targeted to one person (Farkas & L. Rand, 1997). 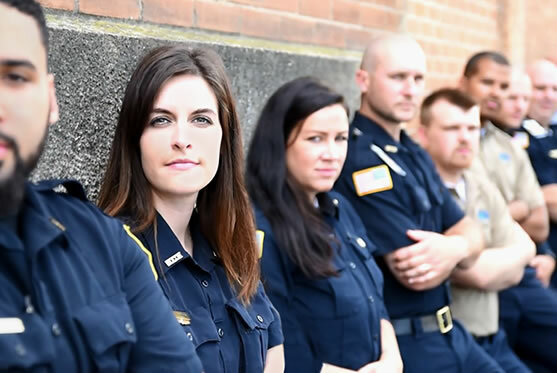 For example, a large number of female correctional officers find their sexual orientation being question especially if they refuse to have sexual relationships with the other party. The women also report having been falsely accused of having sexual relation with their supervisors or inmates (Etheridge, Hale, & Hambrick, 1984). Many of the female workers register dramatic episodes of harassments, however, referring to them as an undercurrent of inequality and sexism. The women in this male-dominated field with difficulty coping with the harsh environment adopt various mechanism. The female officers switch to one of three roles in any present in any unconducive environment like this. The three include the institutional role, the modified role, and the inventive role. The institutional role is where the female acts masculine at all times while enforcing laws. The modified role is where the female officers present themselves as a damsel, accepting sexual favors for the purpose of getting job benefits and promotions. The role allows the women to be watched over by their male colleagues. The inventive role, on the other hand, is where the female officers adopt a neutral level where they do not choose to be masculine or feminine in the job (Flannery, 2011). The changes are inevitable especially in the male-dominated fields. The expectations of Bureau of Labor Statistics are that there will be a growth job opportunity in the correctional facilities among them being jailers and correctional officers. However, it requires interventions to encourage the female workers to join the correctional team as there is a high labor turnover among women. Here are some of the interventions that can be made to increase and retain the number of women in the correctional facilities (Nink, 2008). · Encourage a conducive environment through open seminars where both men and women have a chance to air their issues. · Mentoring both genders through peer support groups and teams. · Create awareness through training for both genders in the correctional system. · Enforcement of strict code of conduct among the inmates.